This Christmas, join Emmerdale's Kelvin Fletcher (Tin Man) and X-Factor Sensation Holly Tandy (Dorothy) down the yellow brick road to the Emerald City for an unforgettable adventure! When a tornado whisks away a young Kansas farm girl, Dorothy, and her dog, Toto, to the merry old land of Oz, they learn that the only way to get back home is to ask for help from a great and powerful Wizard. Whilst on their quest they stumble across a Scarecrow – who is in need of a brain, a Tin Man – who so desperately wants a heart, and a Lion (Radio Wave’s Scott Gallagher) – who could really do with some courage. Together they begin a magical journey as they head off to see the Wizard, the wonderful Wizard of Oz. This production from Selladoor Family (producers of Madagascar, Seussical, Peter Pan) features a timeless and instantly recognisable score, with classics such as We’re Off To See The Wizard, Ding Dong The Witch Is Dead!, If I Only Had A Brain and Over The Rainbow. 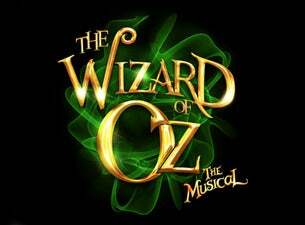 Let the joyous news be spread, The Wizard of Oz at last returns!